With so many different additives available Korallen-Zucht packaged their most popular additives in a Power Package. The addatives included will result in better coral growth, coloration, as well as increased water clarity and sponge growth. Using the power package is a great introduction to the Korallen-Zucht ZEOvit system, at an even better price. 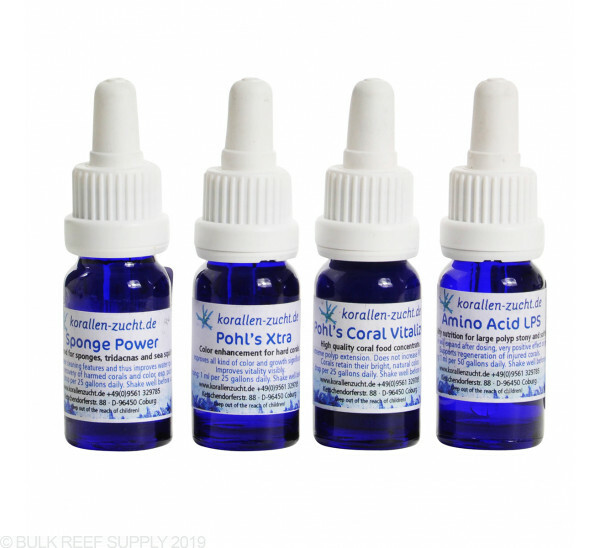 High quality nourishment for corals. This is the most balanced coral food and will not add phosphate or nitrates to your water. Visible reaction can be seen within minutes upon addition to the reef. Noticeable improvements to color, polyp extension and overall health will be peak within ten days. A supplemental additive that significantly improves growth, color, and vibrancy of corals. Routine dosing of Phol's Xtra will have long term benefits that also include improved water clarity, increased robustness and coral health. A revised blend of amino acids formulated specifically to target the needs of LPS and soft corals. Regular use will result in increased color, vitality and growth. Sponge power is a specially formulated food for sponges, bivalves and tunicates. Routine dosing will enhance the growth of these animals, which will have a net effect of supporting their water filtering characteristics and thus improve water quality significantly. Additional benefits include longer growth tips in SPS corals, enhanced colors and improved coral tissue damage recovery. LPS and soft coral improvements have also been reported by many. These include additional tissue growth, polyp expansion and coloration. I bought this on a whim after seeing it in one of the BRS videos. I honestly paid $50 for something I didn't truly expect to see noticeable changes from. Boy was I totally wrong, after two days I noticed my tank looking absolutely incredible. I was a bit confused wondering what had changed. Then I realized it was these supplements. Im not sure which one of the 4 made the changes or if it was simply all of them. But wow. I'm very impressed! The change was quick to happen and very noticeable. Corals looked happier, polyps were extended further, I think my water got clearer too. It was kinda crazy, kinda of like not seeing a growing tank for a couple weeks, but overnight. Honestly one of the most noticeable changes due to a product in my entire reefing career. Very impressed and I will continue to experiment with KZ stuff.. I have a 27 gallon cube and this nano package was great. I'll be buying the larger bottles from now on because the polyp extension i get from this stuff is awesome. Also, i believe the sponge power has contributed to growth of small feather dusters in the tank. To anyone interested in KZ products, i would recommend buying the larger bottles cause these run out quickly. Definitely agree with others these do not last but a few days and gone especially if you have a large tank so if your going to buy just get the bigger ones. As for seeing these amazing changes others state well uh NO! I have not noticed any color or polyp changes with This product but maybe because my tank is already happy and my corals are doing good. I wanted to see if I could get more polyp extension or maybe a little more color but it has not jumped out at me. Maybe with longer dosing periods it will take affect but as for dosing in 2 weeks no changes so you decide for your self. But as always the Bulk team did there part and got it to me fast like they always do. I am very new to reefing and starting with a Nano which I know is not best, but I did. Started off with Frog Spawn and 2 heads were not healthy for 2 weeks. Started the KZ Nano kit and within 2 weeks, the 2 sick heads are coming back and looking good. Very happy with this product. I love it. Colors of corals look great, and polyps are very full looking. I will definitely continue to use. It has only been about 4-5 days of use but it appears my blue/green sympodium are finally opening despite no other changes. Overall easy to use as long as you don't mind a quick daily investment that is faster and easier than any other testing for the tank. Cant wait to see if other changes follow over the next few weeks. Thus is the best way to try some.of the best additives I've ever used I've bought two of these to try them and plan on running almost all KZ products from now on. BUY THESE IF YOU WANT AMAZING COLOR AND GROWTH. I have been keeping a reef tank for 20+ years and have NEVER had a product make such a HUGE impact on my tank so fast. After just a few days the results were very noticeable. I have been using this for 10 days now and the results are really amazing... LPS are huge especially brains and torches. SPS colored up a lot and the shrooms are showing colors I didn't know they had! Also , so far I have not noticed any increase in algae on the glass, substrate or live rock. if you have expensive corals, or just love the hobby, these products will make you appreciate the work that you will save to have amazing corals.If you want to have great growth and coloration and less feeding of corals. buy these products just get larger bottles. I sell coral and keep them in tanks with use of these products before even trying to sell them to get the coloration and health I want before I to sell to my clients. How big are the nano bottles? Great question! The Nano Power Package includes 1x 10mL bottle of of the 4 products. How would you adjust the dose if you are running a tank smaller then 25 gallons. I am running a 10G nano, what should my dose be? Unfortunately there is not a 100% way to use a smaller amount than needed. Additionally you may be able to dilute the concentrate in a very small amount of RO/DI water, reduce the concentration with 4:1 of water to get a smaller ratio. Feel free to let us know if you have any further questions! Any of these require refridgeration? Typically any organic nutrient sources should be refrigerated to preserve their nutritional content. The Coral Vitalizer and Amino acid supplement, as well as the Sponge Power would be good to refrigerate. I am already dosing the BRS 2-part Cal/Alk system on my 50 gallon. Would this interact poorly with the BRS 2-part? Would any of the supplements included be redundant if BRS 2-part is already in use? This is a great addition to standard Two Part and none of the components are redundant. The nano Power package will supplement Trace elements while 2 part focuses on Calcium, Alkalinity and magnesium. New to reeling and corals. I have a 65 halt tank with a 10 gallon wet dry bio ball dump and pro turn skimmer. Do I I have to turn all the pumps off and for how long when I feed? You will not need to turn off when feeding unless other items are being fed as well and pumps are turned off to feed the fish for example. No necessary measures will need to be taken. Do you need to Zeovit media or any other Zeovit system products before using this? The Nano Power Package does not require the use of any other Zeovit additives or media. It is a stand-alone system that will help your overall biological balance and help feed your corals leading to increased growth. All elements will be added daily. Which of these products need to be refrigerated? Normally any food additive or bacterial additive should be refrigerated after opening. Out of those 4 the only one that really doesn’t need it is the Pohl’s Extra, the other three should be refrigerated for the best results and lifespan of the products. Thanks for the question and if you need anything else, just let us know! I am currently using BRS biopellets. Can I start using these zeo products with the BRS biopellets? You should be completely fine to use these products on your tank. There shouldn't be any significant interaction between these additives and your biopellet reactor setup. How much of each liquid is provided in this pack? They are each packaged in 10ml bottles. Do you need a skimmer to run these four products?